The above code will add a single text field (Featured Post ID) to the Edit Category screen. As you can see we are saving the Category ID and Featured Post ID as a single associative array option value in WordPress named category_featured. As you add Featured Post ID values to each of your categories they will be added to this array and saved in WordPress. Příspěvek se automaticky zařadí do výchozí rubriky, i když ji nepřiřadíme. To ale neplatí pro štítky (tagy) a uživatelské taxonomie. 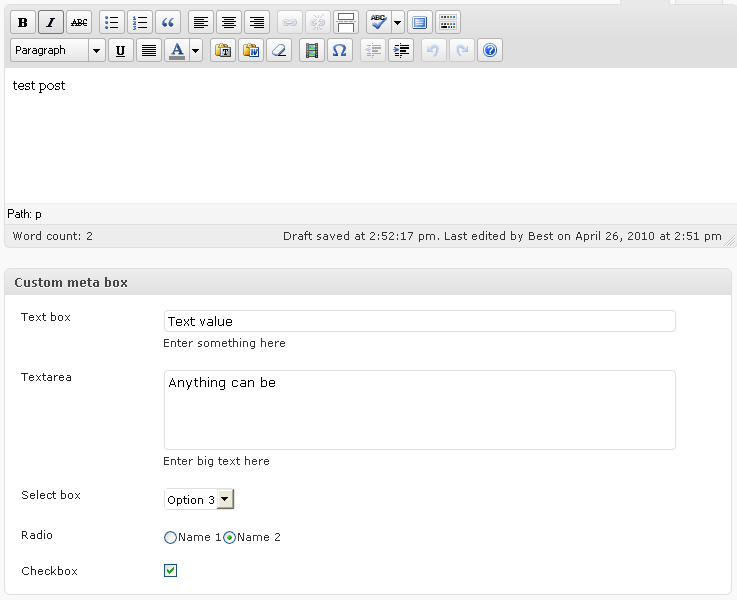 The Rich Text Tags Plugin allows you to edit tag descriptions, category descriptions, and taxonomy descriptions using WordPress' built in rich-text editor. Switch between WYSIWYG and HTML editing modes with the click of a link. Use the WordPress uploader to insert images from your computer or site's Media Library. Now supports user biography fields!